Is it a good idea to keep on building Terminators while living this close to Los Angeles? What could go wrong? Sideshow’s Terminator Endoskeleton Maquette is a painstakingly detailed recreation of the iconic T-800. the Terminator that first struck fear into would be freedom fighters everywhere. Our version features polystone and premium grade ABS plastic elements in order to maintain the crisp details that one would expect to find in a machine crafted by machines. The piece is also made up of over 100 pieces. Poised on a detailed environmental base with piercing glowing eyes. 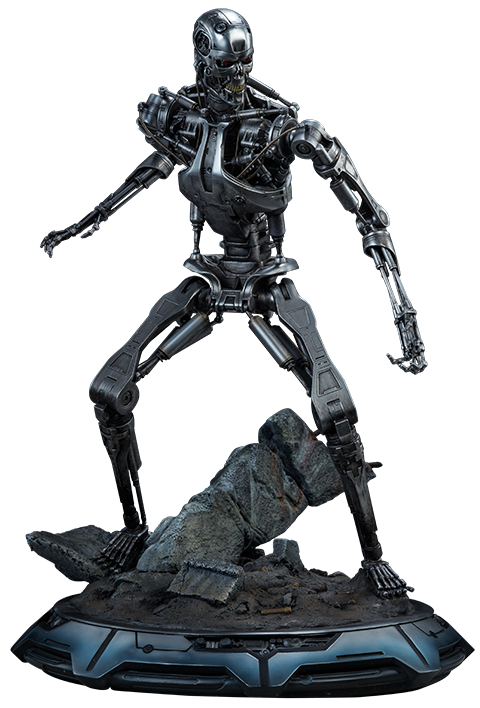 the Terminator Endoskeleton Maquette is a critical centerpiece to any collector who values Skynet over her own safety. © 2016 StudioCanal S.A. "TM" designates a trademark of StudioCanal S.A. All Rights Reserved. Item shown is a prototype. When shipped. the final production piece may differ in appearance.